"New Zealand's kiwi and other flightless birds of the southern continents ... do not share a common flightless ancestor"
"Rangers in Nelson Lakes National Park are puzzling over the discovery of a 'mystery kiwi'"
"It's a tragic fact that at least 90 per cent of juvenile kiwi on the mainland fail to reach adulthood mainly because of predators." "A people's movement is rallying in support of the people's bird." "A specially trained sniffer dog has found a large, mature brown kiwi living in bush about to be cleared"
"When Ron Wishnowski went hunting in the Coromandel bush, he was on the look-out for pigs. Instead, he ended up on a mercy dash to save a young kiwi." "The Department of Conservation intends to vaccinate kiwi before bird flu hits." "A one-legged kiwi has been given movie star treatment in the hope his false leg will allow him to lead a more normal life." "Vegetation clearance for development on a block of land on the Kerikeri Peninsula has cost kiwi a prime local habitat." Research on kiwi during the last 30 years has unfolded much of the mystery about this remarkable bird. Genetic research in 1995 and 2003 has redefined the species, identifying five instead of the previous three, with two variations of one of the species. Three distinct groups of North Island brown kiwi, the species with the largest population, have recognizable variation which with further research may reveal more subspecies. One group of North Island brown kiwi with recognizable variation, and the most dense concentration is in the Northland region, covering an area from coast to coast from Whangarei north to Kaitaia. There are up to 20 pairs in a square kilometre in the Waipoua kauri forest. Brown kiwi are commonly found in native forest and its margins, and shrubland, but sometimes occupy nonindigenous pine plantations and rough, partly developed farmland. A second distinguishable group is in two continguous territories - one extending from the top of the Coromandel Peninsula down through the Kaimai Range. The other area starts in the northern Ruahine Range at about the same latitude as Taihape, and extends north through the Kaweka and Animanawa Ranges, Whirinaki Forest Park, Te Urewera National Park, ending in the Raukumara Range on the East Cape. The third noticably different group are in two areas - surrounding Mount Taranaki; and an area that includes and surrounds Wanganui National Park, and covers all of Tongararo National Park. There are about 25,000 North Island brown kiwi remaining, equal with the Southern tokoeka species as the largest population. The kiwi egg sets a world record, weighing up to one-fifth of the female's body weight, and equal in volume to six hen's eggs. The largest recorded egg weight is 500 grammes. North Island brown kiwi produce up to six eggs in three clutches during a good season that extends through winter, spring and summer (May to February), whereas great spotted kiwi only lay one egg in a season. Males and females share incubation in some species, but little spotted and North Island brown males do all of it. Incubation takes 75 to 80 days, a period few birds of the world come close to. Parents do not feed chicks at all. The infants immediately feed off their yolk sack and then after a couple of days it is pretty much ready to go, looking like a scaled down adult replica. Chicks start foraging for food on their own outside the nest after four or five days, often without the parents present. North Island brown kiwi Apteryx mantelli. Brown kiwi are 40 cm tall, females weigh an average 2.8 kilogrammes and males weigh 2.2 kg. 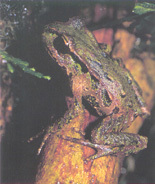 Rowi were scientifically described in 2003 as a separate species, Apteryx rowi. It was previously identified in 1993 as the Okarito brown kiwi, a subspecies of the North Island brown kiwi, Apteryx mantelli. 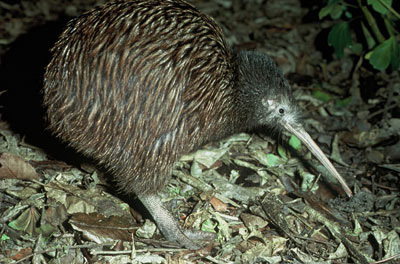 It is the most critically endangered kiwi with less than 250 birds remaining. They occupy the smallest area, just 10 square kilometres in the South Okarito Forest between the Okarito and Waiho Rivers in Westland National Park. The territory of each rowi pair is 100 hectares, which is the largest area for any kiwi. The Okarito taxa is smaller (2.7 kg female, 1.9 kg male) than the related North Island brown, and has a more grey coloration. They are often distinguishable by white plumage on their neck, head and face. A third of the population have an unusual eye defect called a 'poached egg' look, but birds with white eyes that appear to be totally blind are in good health. The remote separation of rowi from their North Island relatives remains a mystery. They must have survived two ice ages during the last two million years, apparently secluded in an isolated forest surrounded by glaciers and ice sheets. Tokoeka are divided into four subspecies. The Northern Fiordland tokoeka is smaller than its Southern Fiordland and Stewart Island relatives, with a population of about 10,000 birds. The Southern Fiordland subspecies has a population of 5,000. 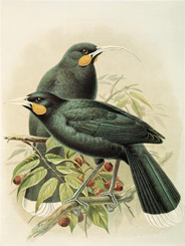 The Stewart Island tokoeka Apteryx australis lawryi is restricted to Stewart Island, but has the healthiest population of 20,000. The secluded World Heritage site of Fiordland National Park at the bottom of the West Coast of the South Island is one the wettest places on Earth, where prevailing rain clouds from the Tasman Sea smack into peaks immediatly rising 6,500 feet from the coast, and dump 21 feet of precipitation a year. The kiwi inhabiting forests in some locations seldom see sunshine. Their resilience is helped by warm waterproof feathers, and their thick oily skin. Tokoeka are similar in height and weight to the North Island brown kiwi. The tokoeka's brown and grey plumage is softer than the North Island brown, and its bill is cream to light pink. They cover a broad range of habitat, from dunelands to native forest and its margins, and subalpine shrubland. The differences between the Haast and Fiordland/Stewart Island tokoekas remain a mystery to science. A possible food barrier was established by ultramalfic rock formations between Fiordland and South Westland. A donation to Terra Nature Fund for New Zealand conservation is tax deductible in the United States ..... a donation directly to a New Zealand charity is not. 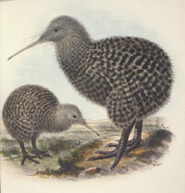 Image left: Infant North Island brown kiwi (left) and Little spotted kiwi (right). John Gerrard Keulemans 1842-1912, Little spotted kiwi 1888. Permission of the Alexander Turnbull Library, National Library of New Zealand, Te Puna Matauranga o Aotearoa must be obtained before any re-use of this image. The little spotted kiwi is the smallest kiwi species with a height of 25 cm, and an average weight of 1.3 kg for the female and 1.1 kg for the male. It is the only kiwi species that is gradually growing in number, because it is only on pest-free offshore islands. The 1100 birds are thriving on Kapiti Island which is a source for translocation to other islands. There are a total of about 50 birds in five smaller groups on Long Island (5) in Queen Charlotte Sound, Mana Island (2) south of Kapiti, Hen Island (50) off the Northland coast, Tiritiri Matangi Island in the Hauraki Gulf, and Red Mercury Island (30) off the Coromandel coast. Apteryx haastii has similar brown and gray spotted plumage to A. Owenii, but is much larger. It is the largest of all kiwi species - 45 cm tall, with the female weighing an average 3.3 kg and up to 4 kg. Males average 2.4 kg. It has a shorter 10-12 cm long beak, and the female only lays one egg in a breeding season. Great spotted kiwi are mountain dwellers in upland forest and subalpine shrubland and grassland, with the biggest concentration in Kahurangi National Park and northwest Nelson. They also make their home in coastal hill country south of the park down to Westport, the Paparoa Range between Westport and Greymouth, and a territory covering Arthur's Pass National Park and adjoining area north to Lake Sumner. 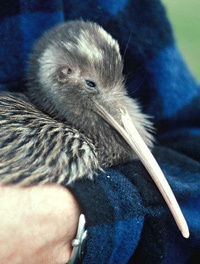 It was estimated in 1998 that there were 20,000 great spotted kiwi. The Haast subspecies is the rarest tokoeka kiwi, reduced to the second smallest population of kiwi of less than 200 birds. Their area in the vicinity of the Cascade and Haast Rivers of South Westland, is separated from the smallest kiwi population, the Okarito brown kiwi, by 150 km of forested ranges and coastal lowlands. Haast tokoekas occupy two distinctly different lowland and subalpine locations - in the upper limits of forest and the tussock covered slopes of the Haast Range, and in forest at the base of the range. A greater number are above timberline, where burrows in the tussock slopes are buried beneath snow during the winter. Two or three clutches in a season normally consist of one egg. Eggs are sometimes laid when there is still snow cover in August or September. Haast tokoekas have red-brown feathers, and are about the same size as their close Fiordland/Stewart Island relative, and the Apteryx mantelli species. Copyright © 2003-2009 TerraNature Trust. All rights reserved.